In the previous few months since the launch of the ConcertinaMuseum.com site on 1st November 2011, we have added new items to many of the sections within the Collection. - Eight additional Wheatstone concertinas, including early instrument No 349 (sold 1839) and No 630 (sold 1843), and No 60,020 - one of the first Wheatstone instruments made by Steve Dickinson after his acquisition of the Wheatstone concertina manufacturing business in the 1970s. -	Two additional Joseph Scates concertinas, including early instruments No 294 and No 164. -	Five additional George Case concertinas, including early instrument No 153. -	Two additional Rock Chidley concertinas, instrument No 3228 and No 3067/6. -	An additional Keith, Prowse labelled concertina, instrument No 1003. - An additional Nickolds concertina , instrument No 3146. -	Four additional Lachenal and Louis Lachenal concertinas, including the very early instrument No 1428. -	An additional early rectangular German 2-Row Anglo concertina, very early un-numbered instrument. 2: Newly-added C15 Items - Free-reeded instruments related to the concertina, and other Wheatstone material in the Collection. The full C15 Section can be viewed here: The New Additions include a third Wheatstone Symphonium, two rare Demian Austrian Accordéons, (one from Charles Wheatstone's own Collection at King's College, London), and thirteen Flutinas or French Accordéons Diatoniques. -	Two Demian Austrian Accordéons, forerunners of the French Flutinas, with open pearl pallets that influenced Wheatstone in his creation of the first open-pallet concertina models in the early 1830s. -	Thirteen Flutinas or French Accordéons Diatoniques. This hugely popular French-made accordéon was much imported into Britain from the 1840s onwards. The Non-concertina Items section of the Collection may be viewed here, and includes images and published material on all concertina- and Wheatstone-related Items and publications, (no concertinas, but including related instruments), images, photographs, postcards, posters, advertising, makers' information, music, tutors, recordings, research material and archives. NC.3.1.1.4-001 - An American Stereo-Graph card featuring a gaggle of monkeys, one playing a primitive 5-key Flutina. NC.3.1.1.5-001 - This huge colour print, in its original frame, features an well-dressed young lad, playing a very realistic 20-Key German concertina (8-Fold bellows, metal corners, metal keys). NC.3.1.2.5-018 - A double-sided page from an American magazine, the main image showing three clowns, one on huge stilts, one a trumpet-holding dwarf, and with a classically-dressed clown holding a Wheatstone English Æeola concertina. NC.3.1.2.5-019 - A striking photograph of the performer Will Coleman, who is holding two large Wheatstone Æolas, his lady partner, both of them standing before a 10ft tall end-plate model of a Wheatstone's Maccann Duet Æola - with double doors! NC.3.1.2.5-020 - This fine Carte-de-Visite photograph features Eileen and Maynie, twin girls each playing an 2-row Anglo concertina. NC.3.1.3.7-001 - One of a series of five early 20th century images of the Manningham Concertina Band, active in the Cleckheaton area of Yorkshire. Manningham adopted the “Black-Face” look, and their instrumentation seemed to favour Anglo concertinas, rather than the English or Duet-fingered instrument preferred by other northern Bands. This first and largest of the five photographs feature ten members, all in fancy-dress, and with anglo concertinas and large and small drums. NC.3.1.3.7-002 - One of a series of five early 20th century images of the Manningham Concertina Band, active in the Cleckheaton area of Yorkshire. Manningham adopted the “Black-Face” look, and their instrumentation seemed to favour Anglo concertinas, rather than the English or Duet-fingered instrument preferred by other northern Bands. This second of the five photographs feature seven members, six in a similar fancy-dress, and one dressed as a policeman. They hold Anglo concertinas. NC.3.1.3.7-003 - One of a series of five early 20th century images of the Manningham Concertina Band, active in the Cleckheaton area of Yorkshire. Manningham adopted the “Black-Face” look, and their instrumentation seemed to favour Anglo concertinas, rather than the English or Duet-fingered instrument preferred by other northern Bands. This third of the five photographs features ten members, all in fancy-dress. NC.3.1.3.7-004 - One of a series of five early 20th century images of the Manningham Concertina Band, active in the Cleckheaton area of Yorkshire. This later oval and posed photograph feature three smartly-dressed, Brylcreemed and well-collared young boys, all holding three-row Anglo concertinas. NC.3.1.3.7-005 - One of a series of five early 20th century images of the Manningham Concertina Band, active in the Cleckheaton area of Yorkshire. Manningham adopted the “Black-Face” look, and their instrumentation seemed to favour Anglo concertinas, rather than the English or Duet-fingered instrument preferred by other northern Bands. This fifth of the five photographs feature ten members behind the band's bass-drum, nine in a similar fancy-dress and top-hats. NC.3.1.5.1-014 - An original full-colour front page from The New Yorker of May 21st, 1979, being an artwork by Paul Degen that features a hall table with a concertina and metronome upon it. NC.3.1.5.4-039 - A delightful set of ten Tickets to various Grand Picnics, Centre Concertina Dances, Annual Farmers' Dances and Moonlight Auto Truck Parties! All were hosted by some of the many Concertina Clubs and Concertina Circles throughout the mid-west of the USA. NC.3.1.5.4-040 - An edition of the “World Accordion Review - incorporating The Concertina”, from 2nd May 1953. This edition announces the first Annual social gathering of the International Concertina Association, which included Alf Edwards, Herbert Greene, Fayre (four) Sisters, Harry Minting, Peter Honri and many others. NC.3.2.1.1-041 - One of a group of publicity cards, adverts and postcards of “George Young, Blind Musician”. NC.3.2.1.1-042 - A good image of a young man playing a square Bandoneon, with pearl keys and chamfered corners. English card, divided rear. NC.3.2.1.1-043 - A modern colour print post card of a sombre clown playing a good representation of a metal-ended British Anglo concertina- or even a Jeffries Duet! NC.3.2.2-022 - Postcard of red-nosed girl dressed in gingham frock, and pigtails: she sings with a small boy, who's holding a hexagonal German multi-bellowed Anglo. NC.3.2.2-023 - A most unusual double-sided colour post card from the Bazaar, Exchange and Mart Series, in which the Address side has a dapper gent holding a many bellowed Anglo concertina. NC.3.2.3-029 - A colour Dudley Hardy post card of a scruffy busker, playing an octagonal concertina, whilst a disturbed man peers out of his bedroom window, blunderbuss in hand! NC.3.2.3-030 - A British “Valentine’s Series No 4034” post card of WW1 era of a group of relaxed soldiers, (one plays concertina) headed “Getting ready for the Invasion” and singing “Tipperary”. NC.3.2.4.1-014 - A 1950s embossed colour photo post card, with large “6” and “Joyous be your Sixth Birthday”: A cheerful boy holds a large teddy with large Anglo concertina at his feet. NC.3.2.4.1-015 - A 1950s embossed colour photo post card, with large “6” and “A Happy Birthday”##: A cheerful boy in a Robin-Hood hat holds a large Anglo concertina. NC.3.2.4.1-016 - One of the many variants of the “Three Kittens plus Anglo Concertina” card that appear from various countries, and are used for various events and for various greetings cards, in this section used as Birthday Greetings post cards. Both cats and concertina are particularly realistic. NC.3.4-029 - A large framed calendar for the year 1914, produced as an advert for W Gill & Sons, Family Grocers, Sheffield. The large full-colour print above the calendar and address is of a cheeky boy in straw-filled barn, playing a large Anglo concertina to three howling terriers! NC.3.5-014 - A cluster of 13 Military-themed scrapbook-scraps, some with their name-tags still attached, that includes two scraps of a uniformed soldier playing an octagonal concertina. NC.3.5-015 - A coloured stand-up Valentine scrap, of a young lass playing her concertina to a crowned frog seated on a heart! NC.3.8-007 - Page No 24 from "Country Life", 27th November 1997, the page featuring a cartoon by William Heath Robinson entitled "The Musician" of an eccentric bearded player with an immensely-bellowed concertina. C.114 - Wheatstone 60020 - C Wheatstone No 60,020. A later Dickinson Period 1970s model of a good Wheatstone's "metal-ended" 36-Key Treble English concertina. This model is a good quality Live-Oak sided "Dot and Comma” fretted, 36-Key English , No 60,020, made in the 1970s. C.115 - Wheatstone 10985 - C Wheatstone No 10985. 24-Key English system, No 10985, with the now standard "By Her Majesty's" label, and exhibiting all the post-1848 design features , and now has a single-depth end and bellows frame, with the single depth mahogany fret-frames nestling over the inset action board. The frets are now machine-cut. The reeds are now always in round-ended brass reed-frames, and the small annular pan-label bears Wheatstone & Co's 20 Conduit Street address. C.116 - Wheatstone 9489 - C Wheatstone No 9489. A 48-Key English system, No 9489, with the original "By Her Majesty's.." Conduit Street Label. Another appearance in the Collection's Wheatstones of the mid-1850s highly decorative, gilt-embossed, brass-inlaid design. Fine machine-cut rosewood frets (some damage, straps absent). Round-ended brass reed-frames, a large annular pan-label bearing the Wheatstone & Co address. C.117 - Wheatstone 349 - An 1839 period 45-key Wheatstone English system, No 349, with additional new features showing the progression to what may be called the "Standard" 48-Key layout. It has 23 keys to the RH side, and 22 Key to the LH side. C.118 - Wheatstone 4247 - C Wheatstone No 4247. A 48-Key English system, No 4247, with the now standard "By Her Majesty's" label, and exhibiting all the post-1848 design features introduced by Louis Lachenal during his time as Manager at Wheatstone's Conduit St premises. The frets are now machine-cut.The reeds are now always in round-ended brass reed-frames, and the large annular pan-label bears Wheatstone & Co's address. C.119 - Wheatstone 5922 - C Wheatstone No 5922: A 48-Key English system, No 5922, with the "By HER Majesty's" label: Another early appearance in the Collection's Wheatstones, of the mid-1850s highly decorative, gilt-embossed, brass-inlaid design. and exhibiting fine frets, now machine-cut. Rosewood case. C.120 - Wheatstone 630 - An 1843 period 44-key Wheatstone English system, No 630, with additional new features showing the final stages of the progression to what may be called the "Standard" Wheatstone 48-key design. This model has 22 keys each side (not yet in the later 48-key format). C.121 - Wheatstone 1190 - 48-Key English system, No 1190, with later "C Wheatstone & Co" West Street label. Ivory keys, probably later black leather "West Street Style" bellows, and with dark fabric baffles replacing sub-fret pine board baffles. Case absent. Square-ended reed-frames, with later steel tongues, faint dealer's or repairer's label stamped on inner face of RH pan. C.163 - Joseph Scates 294 - A Joseph Scates 48-Key English system concertina, Serial Number 294. This lavishly-made model has hand-cut two-ply Amboyna-veneered frets, amboyna-veneered case and green glossy leather bellows. It boasts the rare "Joseph Scates, 26 College Green, Dublin" address label. C.164 - Joseph Scates 164 - A Joseph Scates 48-Key Single Action English concertina, Serial Number 164, hand-cut solid mahogany frets, with the early "40, Frith Street, Soho" address label. 48 Later domed chrome-plated metal keys, square-ended brass reeds, 4-fold green leather bellows with early "Gilt Circle & Dot" papers and repairs to leather around bellows frames. A rare single action format, with single-sided reed pans, and non-return valves within so that air can be taken in quickly when playing (on push only) exhausts the bellows. Somewhat of a budget model, with simple hook-and-wire action, simple fret-pattern, pine sub-fret baffle bearing label and stamper serial number. C.213 - George Case 895 - An early 48-Key Mahogany-ended English concertina, by George Case: No 895 Ivory keys, original thumbstraps, "Late Joseph Scates" label, 4-fold dark green leather bellows. Pine baffles, round-end brass reed-frames, Original RH thumbstrap, case missing. C.214 - George Case 2950 - 48-Key Rosewood-ended English, by George Case: Serial No 2950, Side Stamped number 2752, and with the Boosey & Sons, Holles St label wording: Silver-capped metal keys, round-end brass reeds with brass tongues, green-leather 5-fold bellows, inset from frame, gilt-on-green floral bellows papers, worn black leather thumbstraps, original rosewood case. C.215 - George Case 3834 - 48-Key Rosewood-ended English, by George Case: Side-Batch No 3834, with the Boosey & Co, Regent Street label wording: Ivory keys, original black leather thumbstraps, original rosewood case. This late model has no LH Serial Number, nor any internal Serial Numbers - just the 3834 Batch Number side-stamp used on most of the instruments made during the various Boosey's ownership periods. C.216 - George Case 153 - A 48-Key, rosewood-ended George Case concertina, No 153, on all parts. The label has 'Late Joseph Scates' label wording, ivory keys, square-ended reeds, green leather bellows with "gold-cross, dots and hexagon-tracery" papers and silk-reinforced bottom-bout. Square-ended brass reeds. Later home-made cubic wooden box. C.217 - George Case 3660 - 48-Key brass-mounted, amboya-veneer-ended George Case "English" concertina No 3660, 48 solid-silver capped nickel keys, bushed, round-ended steel reeds, in a double-reed pan with complex sub-pan baffle. It has the Boosey & Co., Holles Street version of the George Case scalloped label, on grained chamois sub-fret baffle. Gilt-embossed green leather bellows and thumb-straps, original Amboyna-veneer brass-mounted case. C.250 - Rock Chidley 3228 - Rock Chidley 48-Key rosewood-ended English concertina, Serial No 3228, the label wording unclear, due to the Lachenal & Co label that was glued over it. Probably of 135 High Holborn origin, since this instrument is closely related to Item C.239, Serial Number 3220. Another appearance of bevelled edges to the rosewood fretwork of the ends, original black leather straps. 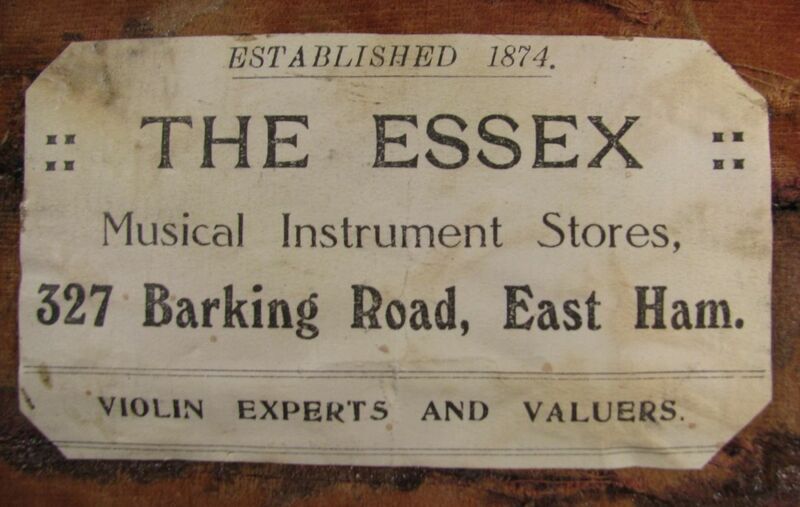 Serial No 3228, with original mahogany case having a fine dealer's label of The Essex Musical Instrument Stores. D.251 - Rock Chidley 3067/6 - Rock Chidley 48-Key rosewood-ended English concertina, Serial No 3067 (3066 on bellows frame), with the "High Holborn" label wording. Another appearance of bevelled edges to the rosewood fretwork of the ends, original black leather straps.5-Fold green leather bellows with delicate Gilt Floral on White papers, Serial No 3067/3066, with original rosewood-veneered case. D.257 - Keith, Prowse 1003 - A 48-key "Keith, Prowse & Co" English, 48 Cheapside label, serial No 1003, with matte Rosewood ends, ivory keys, gilt embossing on bellows, RH thumb-strap and on finger rest leathers. 5-Fold green leather gilt-embossed bellows, with modern green leather edging to folds. Square-ended reed-frames with brass tongues. Possibly partly of Geo Case or Rock Chidley manufacture. E.270 - Nickolds 3146 - 48-Key English system concertina by Nickolds Bros, No 3146, Ivory keys, black leather bellows, baffles missing. Later crude leather thumb-straps, plain fret pattern. Nickolds' Style open-sided reed tongue securing cross-pieces. Hexagonal mahogany case. C.322 - Louis Lachenal 8301 - 48-Key English system No 8301, with "Louis Lachenal" label. A good quality rosewood-ended model, with brass floral end-inlays, gilt embossed bellows and straps, silver-capped metal keys. This model exhibits all the post-1848 design features developed by Lachenal. This quality model has the divided end and bellows frame, and the frets are machine-cut. The reeds in this and later models are now always in round-ended brass reed-frames, and the large annular pan-label bearing Louis Lachenal's "Lit James St" address. silver-capped metal keys, gilt-embossed 5-fold green leather bellows and thumbstraps, floral green/gilt papers. Large circular reed-pan label, original white chamois leather sub-fret baffles. Rosewood veneered case with original unbroken top-strap (a rare survival), plus leather outer case. C.323 - Louis Lachenal 18601 - Louis Lachenal 48-key English concertina, No 18601. Rosewood ends, label absent , brass reeds, yellow chamois pan leather, and with features of "budget" contruction. No case. The frets are now machine-cut, with pine sub-fret baffles. The reeds are in round-ended brass reed-frames, and there is large annular pan-label bearing Louis Lachenal's "Lit James St" address. Four-fold green leather bellows with Gilt Stars and Dots bellows papers. Original green leather thumb-straps, no case. C.347 - George Jones 609 - A very early George Jones 22+1-Key Anglo concertina, Serial No 609. No Label . . A very early form of the Jones two-row Anglo concertina, with an early style of stained rosewood ends and simple fretwork that appears on the many basic 2- and 3-row anglo concertinas produced by the George Jones workshops. Replacement RH hand-bar, and no case. C15.01-003 - Wheatstone Symphonium No 128 - A Wheatstone Symphonium, serial number 128, with nickel-silver reeds, 24 keys, and fully engraved with Wheatstone's 20 Conduit Street address. This model is a later 24-key version, with a full four columns of keys either side, (one ivory top-stud missing from LH B-flat Key), and with a button layout identical to that which would be used on the very earliest Open Pallet Wheatstone English system concertina. (See the Open Pallet in The Collection). C15.3.1-001 - A 17-Key Demian accordéon - This rare and early Demian Accordéon originates from the remains of the “ Wheatstone Museum Collection”, King's College, London, from where it was disposed of in the 1960s. It bears the exposed circular pearl pallets and ebony levers that influenced Charles Wheatstone when he created the first “Open Pallet” concertina in the early 1830s. C15.3.1-002 - A 10-Key Demian accordéon - This rare and early Demian Accordéon originates from the “Ruth Askew Collection” ( http://www.forest-tracks.co.uk/paulmarshs/pages/ruthaskew.html), and was part of a small collection of concertina-related items, bandoneons and Flutinas acquired from her family after her death in September 2009. It bears the exposed circular pearl pallets and ebony levers that influenced Charles Wheatstone when he created the first “Open Pallet” concertina in the early 1830s. Thirteen Flutinas or French Accordéons Diatoniques. C15.3.2-001 - An 8-plus-2-Key “Flutina” or “ Accordéon Diatonique”. An early model, with cantilevered brass connector to rear of the keyboard, operating a pair of rise-and-fall pearl pallets leading to drone chordal reed-plates. C15.3.2-002 - A 12-plus-2-Key "Flutina" or "Accordéon Diatonique". An early model, with cantilevered brass connector to rear of keyboard, operating a pair of rise-and-fall pearl pallets leading to drone chordal reed-plates within. C15.3.2-003 - An 8-plus-2-Key "Flutina" or "Accordéon Diatonique". An early model, with a pair of rise-and-fall brass sliders operating pearl pallets leading to drone chordal reed-plates within. Sold from the Vichy (France) Auction of historic Flutinas in 2010. C15.3.2-004 - An 10-plus-2-Key "Flutina" or "Accordéon Diatonique". C15.3.2-005 - An 15-plus-2-Key "Flutina" or "Accordéon Diatonique". An early model in two-row form, with a cantilevered brass connector to the rear of the keyboard, operating a pair of rise-and-fall pearl pallets leading to drone chordal reed-plates. Sold from the Vichy (France) Auction of historic Flutinas in 2010. C15.3.2-006 - An 19-plus-2-Key "Flutina" or "Accordéon Diatonique". A later model in two-row form, with a pair of pivoted levers atop the hand-bar operating a pair of rise-and-fall pearl pallets leading to drone chordal reed-plates. Sold from the Vichy (France) Auction of historic Flutinas in 2010. C15.3.2-007 - An 22-plus-2-Key "Flutina" or "Accordéon Diatonique". A later model in two-row form (the rows on either side of the hand-bar), with a pair of pivoted levers atop the hand-bar, with perforated brass end-covers, operating a pair of rise-and-fall pearl pallets on curliqued brass levers, leading to drone chordal reed-plates. Acquired from the Ruth Askew Collection . C15.3.2-008 - An 19-plus-2-Key "Flutina" or "Accordéon Diatonique". C15.3.2-009 - A 19-plus-2-Key "Flutina" or "Accordéon Diatonique". A later model in two-row form (the rows on either side of the hand-bar), with a pair of pivoted levers atop the hand-bar, with perforated brass end-covers, operating a pair of rise-and-fall pearl pallets on curliqued brass levers, leading to drone chordal reed-plates. C15.3.2-010 - A 25-Key "Flutina" or "Accordéon Diatonique". A later, more developed model in two-row form (the rows of 12 and of 13 keys on either side of the hand-bar), this model without with any pivoted levers atop the hand-bar. Sold from the Vichy (France) Auction of historic Flutinas in 2010. C15.3.2-011 - A 24-plus-2-Key "Flutina" or "Accordéon Diatonique". A later, more developed model in two-row form, with two rows with a pair of pivoted levers atop the hand-bar, with perforated brass end-covers, operating a pair of rise-and-fall pearl pallets on curliqued brass levers, leading to drone chordal reed-plates. C15.3.2-012 - A 24-plus-2-Key "Flutina" or "Accordéon Diatonique". A later, more developed model in two-row form, with two rows (12 and 12, either side of hand-bar). There is a pair of pivoted levers atop the hand-bar, operating a pair of rise-and-fall pearl pallets on curliqued brass levers, leading to drone chordal reed-plates. C15.3.2-013 - A 31-plus-2-Key "Flutina" or "Accordéon Diatonique". A later, more developed model in two-row form, with two rows (15 and 16, either side of hand-bar). There is a pair of pivoted levers atop the hand-bar, operating a pair of rise-and-fall pearl pallets on curliqued brass levers, leading to drone chordal reed-plates. The finely carved pearl keys are of a carved bird profile. This page created Thursday 16 February 2012.